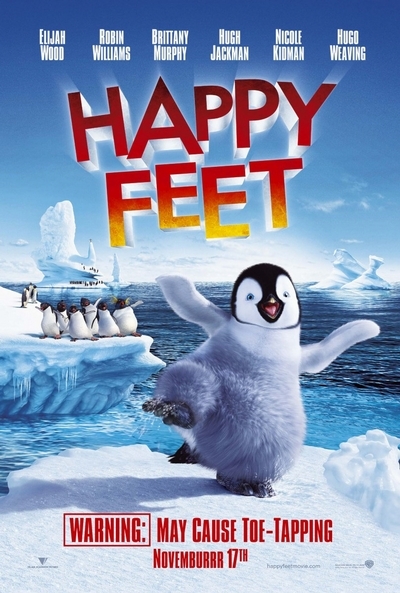 Story: In the great nation of Emperor Penguins, deep in Antarctica, you're nobody unless you can sing - which is unfortunate for Mumble (ELIJAH WOOD), who is the worst singer in the world. He is born dancing to his own tune ... tap dancing. Mumble is just too different - especially for Noah the Elder (HUGO WEAVING), the stern leader of Emperor Land, who ultimately casts him out of the community. Away from home for the first time, Mumble meets a posse of decidedly un-Emperor-like penguins - the Adelie Amigos. Led by Ramon (ROBIN WILLIAMS), the Adelies instantly embrace Mumble's cool dance moves and invite him to party with them. In Adelie Land, Mumble seeks the counsel of Lovelace the Guru (also voiced by ROBIN WILLIAMS), a crazy-feathered Rockhopper penguin who will answer any of life's questions for the price of a pebble. Together with Lovelace and the Amigos, Mumble sets out across vast landscapes and, after some epic encounters, proves that by being true to yourself, you can make all the difference in the world.